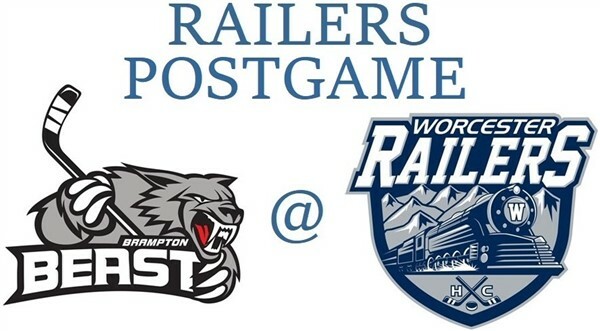 The Worcester Railers took on the Brampton Beast Sunday afternoon at the DCU Center needing a win, preferably in regulation, to keep their slowly deteriorating playoff hopes alive. And for two period it looked like Worcester had put their Saturday night debacle behind them. Drew Callin, who was a scratch for the Railers Saturday night, got his team on the board at 2:19 of the opening period when he took the rebound of a David Quenneville shot and with Brampton goaltender Jake Paterson down and out fired it into the yawning net. The Beast answered right back with a nice blocker side blast by Daniel Leavens at 2:46, but at 6:52 Callin connected again with an absolute laser of a shot from the top of the right wing circle over Paterson to make it 2-1. Mike Cornell and Ross Olsson had the assists on the play. Tyler Barnes would make it a two goal lead at 7:48 when he tipped an Ivan Chukarov blast from the left side point past Paterson. Quenneville had the secondary helper on that goal. Brampton would add another goal in the period, this one by Jonathan Racine, to make it 3-2 after twenty minutes. Cornell gave Worcester its two goal lead back at 8:03 of the middle period after playing pitch and catch with Barry Almeida while the Railers had a two man advantage. Matty Gaudreau sent a pass to Cornell in the high slot, who continued the puck down low to Almeida. With his shooting lane blocked Almeida returned the puck to Cornell, and the captain’s low shot beat Paterson to make it 4-2. But Worcester’s inability to capitalize on another lengthy five on three advantage would come back to haunt them. In the final twenty minutes Brampton, playing their fourth road game in five days, looked like a playoff team on a mission while the relatively well rested Railers looked like a team playing out the string. The Beast would go on to score four times in the third period on Worcester goaltender Mitch Gillam, with two each by both Jackson Leef and former WorSharks forward Daniel Ciampini, to turn a two goal lead into a two goal deficit for the team. Racine’s empty net goal, which made him an amazing +6 on the day, was a dagger both in the hearts of Railers fans but also to Worcester’s playoff chances. Marc Lachance, a longtime friend to this and other blogs I’ve written for over the years, tweeted a regulation loss by the Railers Wednesday against the Manchester Monarchs will eliminate them from playoff contention. Scratches for the Railers were Bo Brauer, Evan Buitenhuis (14-day IR/lower body), Connor Doherty, Kyle McKenzie (14-day IR/season), Tommy Panico (14-day IR/season), Matt Schmalz, Yanick Turcotte (suspended), and Alex Vanier (14-day IR/upper body). Blake Wojtala was the back-up goaltender. While there’s been no official announcement by the ECHL it appears Yanick Turcotte was suspended one game due to his game misconduct in Saturday night’s game. Turcotte threw a late punch in the fracas that apparently brushed the linesman. The Railers had no official comment beyond that. There was a penalty timing error in the second period that cost Worcester seven seconds of power play time. It started with David Pacan being called for tripping at 7:37. Nathan Todd was called for roughing at 9:20, giving the Railers a five on three for 17 seconds. The problem happened when Chris Martenet was called for tripping at 9:30. That resulted in seven seconds remaining on Pecan’s penalty and 1:50 on Todd’s. By rule the time on Martenet’s minor doesn’t start ticking down until Pecan’s minor is over, and Pecan would have to stay in the box until the next stoppage of play to keep Worcester on a five on three advantage. What happened was the penalty time keeper erased the seven seconds remaining on Pecan’s minor and started the clock on Martenet’s, which cost the Railers the seven seconds that Martenet’s penalty shouldn’t have been counting down. In news that broke Sunday morning, The Canadian Women’s Hockey League (CWHL) will discontinue operations effective May 1, 2019. According to the press release, “while the on-ice hockey is exceptional, the business model has proven to be economically unsustainable.” This will pave the way for some of the CWHL teams to join the National Women’s Hockey League (NWHL), which has teams in Boston, Buffalo, Newark, Saint Paul, and Stamford (CT). It’s unlikely the Worcester Blades will be joining the NWHL unless there is a new ownership group with deep pockets willing to underwrite the franchise. On this day, April 1st, in Worcester hockey history: in 1998 Lubos Bartecko and Michal Handzus all had a goal and an assist in the IceCats 5-2 win over the St John’s Maple Leafs. Shane Toporowsky, Stephane Roy, and Jason Zent all had goals while Jamal Mayers had two assists. Frederic Cassivi made 20 saves. The contest saw 182 minutes in penalties, with Reed Low earning a game high 29 of them…in 2000 Jamie Pollock scored 61 seconds into overtime as the IceCats snapped a five-game losing streak with a 2-1 victory over the Rochester Americans. Daniel Corso tied it with 4:59 remaining in the second period for Worcester. Brent Johnson turned aside 31 shots, including 12 in the final period…in 2009 Patrick Traverse scored at 2:17 of overtime to give the WorSharks a 3-2 win in Springfield. Cory Larose and Matt Jones both scored in regulation, but each time the Falcons would come back to tie it. Larose had the lone assist on the game winner. Thomas Greiss made 30 saves in the victory…in 2011 Carter Hutton made 27 saves in the WorSharks 2-0 win over Manchester. John McCarthy had both goals for Worcester, with Brandon Mashinter assisting on both…in 2014 the WorSharks got a goal and an assist from Travis Oleksuk in their 3-2 win over Portland. Freddie Hamilton and Matt Pelech had the other goals for Worcester while Troy Grosenick made 21 saves…in 2015 Travis Oleksuk and Matt Willows erased a two goal deficit, and Daniel Ciampini and John McCarthy connected in the shootout in the WorSharks 3-2 win in Hershey. Aaron Dell made 36 saves and went six for seven in stopping the Bears shooters…in 2018 Frankie DiChiara had two goals and Mike Cornell had a goal and an assist in the Railers 4-1 win in Adirondack. T.J. Syner had the fourth goal for Worcester while Mitch Gillam made 27 saves. 1st Period-1, Worcester, Callin 2 (Quenneville), 2:19. 2, Brampton, Leavens 10 (Pacan), 2:46. 3, Worcester, Callin 3 (Cornell, Olsson), 6:52. 4, Worcester, Barnes 28 (Chukarov, Quenneville), 7:48. 5, Brampton, Racine 6 (Vallorani, Todd), 12:08. Penalties-MacKinnon Wor (holding), 15:39; Cornell Wor (interference), 16:03. 2nd Period-6, Worcester, Cornell 5 (Almeida, Gaudreau), 8:03 (PP). Penalties-Leef Brm (interference), 6:20; Pacan Brm (holding), 7:37; Todd Brm (roughing), 9:20; Martenet Brm (tripping), 9:30; Martenet Brm (delay of game), 12:37; Folkes Brm (slashing), 13:08. 3rd Period-7, Brampton, Leef 12 (Pacan), 0:43. 8, Brampton, Leef 13 (Pacan, Leavens), 5:36. 9, Brampton, Ciampini 15 (Todd), 11:54. 10, Brampton, Ciampini 16 (Todd, Racine), 16:49. 11, Brampton, Racine 7 (Ciampini), 19:03 (EN). Penalties-Martenet Brm (tripping), 9:51; Almeida Wor (tripping), 12:58. Shots on Goal-Brampton 11-8-12-31. Worcester 10-13-9-32. Power Play Opportunities-Brampton 0 / 3; Worcester 1 / 7. Goalies-Brampton, Paterson 11-12-1-0 (32 shots-28 saves). Worcester, Gillam 19-16-2-3 (30 shots-24 saves). Linesmen-Guillaume Brunelle (73), Neil Frederickson (54).